Year Zero Survival, LLC. will not be held responsible for any injury resulting in misuse or use of any and all items sold. It is the customer’s responsibility to ensure there are no food allergies to any of the emergency food products. In a disaster or emergency situation, Year Zero Survival, LLC. will not be held responsible for any injury or death as a result of uncontrollable circumstances. The information we collect is used to fill order, to contact buyers if they have questions, or to send email to buyers with special offers. Shoppers can be assured that all personal information is protected and will not be sold by us to any outside entities. Upon check out using the PayPal system you will have the option of using any of the major credit cards (Visa, Mastercard & Discover Card) at no extra fee. If you choose you may also become a PayPal member however membership is by no means needed to use a credit card. Orders are typically filled within one to four business days of payment and mailed via UPS ground or Priority Mail. Please note that during the holiday season please allow an additional few days for delivery. Out of stock items may take longer to be shipped and you will be notified. Your delivery charge will be calculated in the Shopping Cart section during your check-out and is based on the price of your total order. Free ground delivery is typically offered for orders over a certain dollar amount. We are sure you are going to love our products however, returns with full refunds (other then shipping and handling costs) are allowed under certain circumstances for unopened items. Depending upon the product a restock fee of up to 15% may be applied. Food and water products can not be returned to be re-sold according to law, therefore refunds for food and water products will not be issued. Year Zero Survival, LLC (“YZS”) sells knives and related merchandise (collectively, the “Merchandise”) only to individuals who can legally purchase and own such items in the particular jurisdiction where they reside. When you order and purchase Merchandise from YZS, you represent that you are of legal age to purchase the Merchandise ordered and that the Merchandise can be purchased and owned in your state, county, and/or city of residence. By offering Merchandise for sale, YZS does not represent or warrant that any specific purchaser may legally purchase, own, or possess the Merchandise ordered. CHECK YOUR LOCAL LAWS! Knives and related YZS Merchandise may be dangerous, even deadly, if used improperly, negligently, and/or illegally. When you purchase Merchandise from YZS, you agree that you will use the purchased Merchandise in a safe and legal manner, consistent with all applicable laws, recognized safety rules, and good common sense. You further agree that you will train and supervise minors in the use of YZS Merchandise and that you will take such steps as may be reasonably necessary or required by applicable law to keep YZS Merchandise out of the hands of minors and untrained and/ or immature individuals. When you purchase Merchandise from YZS, you agree to assume all risks related to and/or arising from your ownership and use of the Merchandise and agree to indemnify and hold YZS harmless from any and all claims brought by any person or entity against YZS related to and/or arising from your ownership and/or use of the Merchandise. 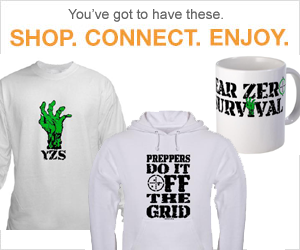 Year Zero Survival, LLC does its best to accurately represent the Merchandise, through photo, price and copy. Occasionally we make mistakes. If such a mistake should occur, your order will be corrected as the facts may dictate. Our website address is: http://yearzerosurvival.com. Are you looking for a special item or something we have not posted on our site? If so, contact us as we will consider every request. Comments, Inquiries or questions are welcome. Visit Year Zero Survival's profile on Pinterest.